Safaris on horseback are the ultimate in horse riding holidays. Not only do these experiences include all the adventure and luxury of a traditional safari holiday, but by being on horseback one truly becomes part of the environment. We believe that there is no greater way to experience the plains of Kenya, the flood waters of Botswana or the bushveld of South Africa than on the back of a horse. Indeed, our rides take place off the tourist track where you can really be submerged into the African way of life, sometimes not seeing anyone else apart from your small riding group. The horse keeps its own senses tuned for wildlife, and by looking in the direction of its ears, many well camouflaged animals are revealed. Once comfortable, a horse will drop its head and graze, signalling all the other grazing animals in the area to relax too. In this fashion one can happily drift along with the animals observing them as they go about their normal daily routines. The safari guides on our rides are the best in the business, knowing by the impression of a paw print or a battered looking tree that there is game in the area. Rides also have a back-up guide and both will delight in teaching you about the area and the animals and vegetation that can be found there. When riding in areas with big game such as lion, elephant, buffalo, black rhino and leopard one should be a confident rider with a secure seat however we have safaris for all levels from complete beginners and many are suitable for non-riders and families too. As well as first-class riding, some of our safaris offer guided walks, game drives or mokoro (canoe) rides. Many of them have swimming pools too which are perfect for a post-lunch rest whilst listening to monkeys squabbling in the trees above. Accommodation ranges from luxury eco-lodges to 5* canvas tents - these tents have to be seen to be believed; they house proper beds with luxury cotton sheets, clothing storage, dressing tables and mirrors, en-suites with hot running water and showers and usually a glorious sun deck outside, complete with wooden furniture. Imagine being woken up with a hot cup of coffee and plate of biscuits delivered straight to your tent, what a perfect way to start the day! Even on 'fly-camps' - a remote 'basic' camp and a must-do on any horse riding safari - you'll be presented with camp beds, mosquito nets, private wash stands and bush toilets. The food on safari is equally delightful, usually 3 or 4 courses with wine to compliment. There may also be a few surpises thrown in here and there (think spectacular sundowners!) but we won't spoil that for you! Just as with Northern Africa, flying to to Southern Africa from Europe has benefits too. Why not take an evening flight departure. You can dine, sleep overnight and then disembarque to eat breakfast in Africa the next day with no jet lag. Some of our safaris are really off the beaten track and extra light aircraft flights or drives are needed to reach camp. We can, however, confirm that these are experiences and mini-safaris in themselves with both pilots and drivers having fantastic knowledge and pointing out animals on the way. Most of our safaris on horseback are, as you would expect, in Africa. 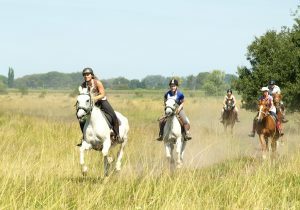 However we also have a horseback safari in Brazil where the wildlife is completely different but no less extraordinary. Luxurious Big Game safari with excellent service levels. Riding Ability Required: Rising trot for 10 minute stretches and the ability to gallop out of danger. Minimum age 12. Both riders and non-riders alike can enjoy the majesty of the Okavango Delta at this unique riding and walking safari camp. Trip Length: 8d/7n/8 days riding. Other length stays available on request. Approximate riding time per day: 4 to 6 hours. Riding Ability Required: Strong intermediate onwards. Must be able to trot for 10 min and gallop out of danger. Easter Special - We are happy to offer the Easter Weekend at low season rate. Fast & exciting mobile tented safari for experienced & adventurous riders only. The Tuli Block is also home to a multitude of wildlife species and remains untouched by the invasion of man. Transfer: 2019: Return charter flight £500 per person. Return road transfers from £412 per car. See notes section for more details. Experience three different fazendas on this fascinating holiday to gain an insight into the Pantanal culture. 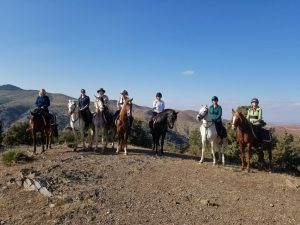 Wildlife, cultural and riding highlights. Transfer: 2019: From Campo Grande Airport to the Pantanal return via road is included. Approximate transfer time is 3 hours 10 minutes.